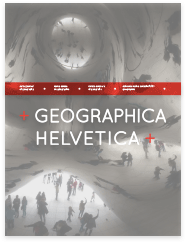 Francisco Klauser is stepping down as book review editor of Geographica Helvetica. When Francisco informed us that he would like to focus more on his new assignment as President of the Swiss Geographical Association (ASG), which is one of the institutional homes of Geographica Helvetica, we thought: it is Swiss geography’s gain but our loss. Francisco has been a crucial figure in the team of Geographica Helvetica in the last years. He has been instrumental in shaping the international outlook, has been tireless in commissioning book reviews, and has brought up many innovative ideas for the "Interface" section of the journal. Francisco truly embodies the cosmopolitan outlook that we strive for in Geographica Helvetica. He is truly multi-lingual, well-versed in the diverse scholarships of Francophone, German-language, and Anglophone geographies and has translated Francophone scholarship into German. This cosmopolitan outlook was also reflected in the diversity of books he sent out for review. The editorial team therefore thought it would be impossible to replace him. We are very delighted, indeed, that we could convince Olivier Graefe, Université Fribourg, to take on the responsibilities as new book review editor. If there is one person in Swiss geography to replace Francisco, it is certainly Olivier. He shares the cosmopolitan outlook that characterizes Francisco’s profile. Olivier was trained in French- and German-speaking university systems and is also extremely well versed in the international geographical scholarship. And he likes books. Olivier has been an important aid for the editorial team as a member of the International Advisory Board. He hosted the first Geographica Helvetica conference in Fribourg in 2012, and we are very happy that he has now agreed to take on new responsibilities in shaping the journal. Hanna Britt will continue her excellent work behind the scenes in managing the logistics of the book reviews.